Lock in a great price for Deliades Hotel – rated 8.5 by recent guests! This place is absolutely beautiful, from the staff to the view of Ornos beach. 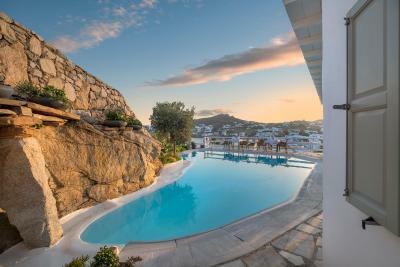 Location was amazing, quiete enough to relax and only a 2 Euro ride away from Mykonos town. I would strongly recommend it to anyone. Cost was also very reasonable in comparison to other places. Close to beach, transportation to and from facility, breakfast, pool walking distance to bus into town. Spacious rooms, Staff was nice and location was good. The hotel was clean. Front desk staff was accommodating. Select restaurant staff less than accommodating. Wouldn't make dietary requests to chef. Rooms were standard. Nothing exceptional. Balcony was best part of the room. Pool was near restaurant. Didn't have lounge chairs. Felt unaccomidating. Not on beach but close to beach. Hard to get chairs on beach because public chairs are limited. Other chairs owned by beachfront properties. For the price I would recommend to finding a beach front or beach access property. Lots nearby with more amenities. Most likely won't stay at this hotel again. Not worth it for Mykonos. The staff was excellent! Very polite, helpful and overall a treat to be around! We stayed in the family suite. There was plenty of room for our family of 4. Quiet and great location. It was easy to walk to Ornos Beach. They shuttled us from and to the new port. Nice place and location close to the beach. The staff was very kind and responsive. The housekeeping service twice a day. The weather in Greece was horrendous while we stayed, but despite this, the hotel staff tried to make it enjoyable. The transfer was perfect. Breakfast was good. The pool seemed lovely although we couldn't use it in hurricane winds. The view of the sea was lovely. 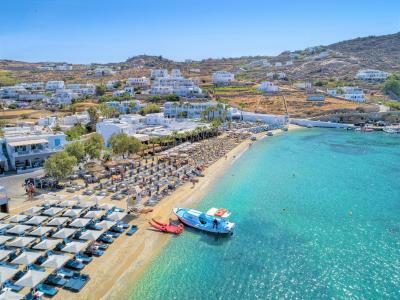 Ornos beach is close, so you can walk to get the bus to Mykonos town. It's the start of the bus route, so you can almost be guaranteed a seat. My husband left his phone behind, and they rushed back to the port to bring it to him. Great service. Deliades Hotel This rating is a reflection of how the property compares to the industry standard when it comes to price, facilities and services available. It's based on a self-evaluation by the property. Use this rating to help choose your stay! One of our top picks in Ornos.Overlooking Ornos Bay, Deliades Hotel features large rooms with free WiFi, a swimming pool with hydromassage and a poolside restaurant. 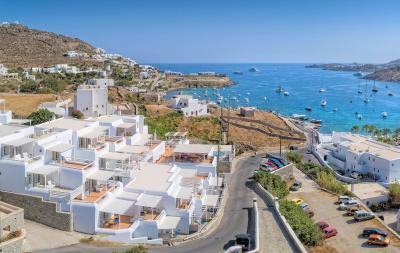 The Cycladic complex is only 150 feet from the beach. 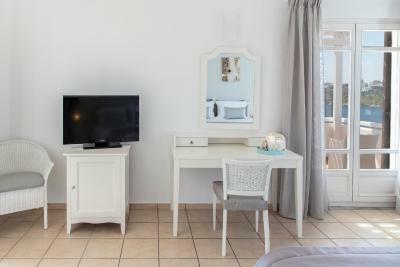 All rooms and suites are air conditioned and come with a flat-screen, satellite TV and mini-bar. 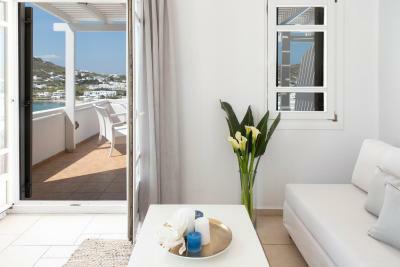 The tasteful units at Deliades are serviced twice daily by maid, while some feature balconies or terraces with views of the bay and the town. An American breakfast buffet, including both Greek and International specialties, is served each morning. 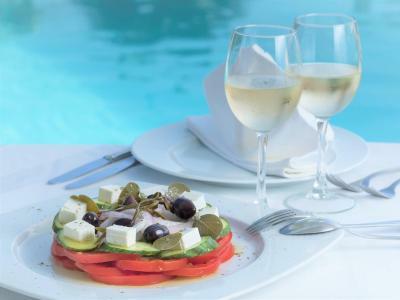 A small choice of starters, salads and main courses are available for lunch, while the a la carte dinner emphasizes in Greek and International cuisine. Free transfer is provided upon arrival and departure. Arrangements for car hire, air and boat tickets as well as excursions can also be provided upon request. 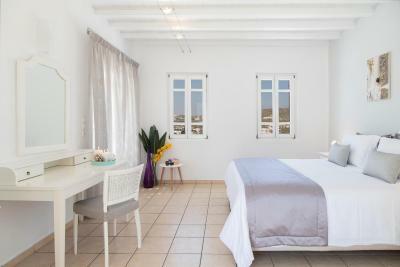 Deliades Hotel is located only a few miles from the town of Mykonos, and connected frequently by local bus. 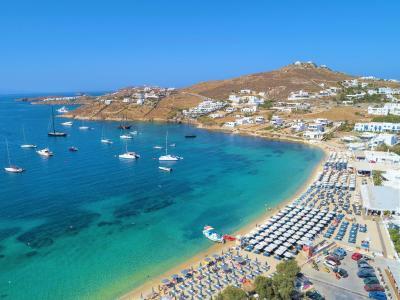 Water taxis connect Ornos beach to other beaches such as Psarou, Platis Gialos, Paradise, Super Paradise and to the island of Delos. This is our guests' favorite part of Ornos, according to independent reviews. When would you like to stay at Deliades Hotel? 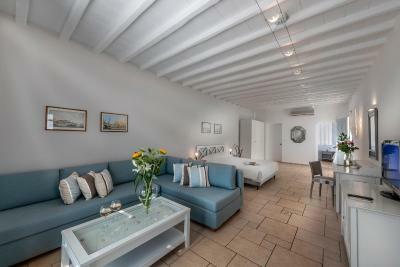 Air-conditioned room with a satellite TV and private balcony enjoying sea views. 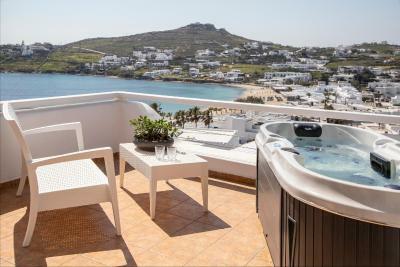 Spacious rooms with sitting area with a sofa bed and big private terrace with view of the Ornos bay. This suite features a balcony, seating area and sofa. This double room has air conditioning and mini-bar. Kindly note that this is an interior room with no view and no balcony or terrace. This suite has a balcony, tile/marble floor and hot tub. This suite features a balcony, tumble dryer and satellite TV. Welcome to Deliades Hotel A luxury hotel in Mykonos Ornos Bay Deliades hotel is situated at the edge of Ornos Bay, up in a small hill.From there, it is overlooking the bay and offers a breathtaking view of Ornos Mykonos beach from all of its rooms.It is one of the best Aegean style Mykonos hotels in Ornos. 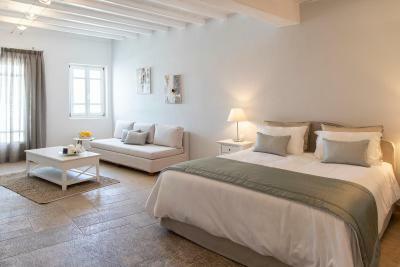 A 4 star hotel in Mykonos that will charm you.Hotel Deliades, built in Cycladic architecture, provides the best accommodation in Mykonos with its spacious rooms.The hotel offers a unique place of relaxation and calmness within a warm environment of elegant design. Modern amenities and the best service will ensure the guests unforgettable moments. The hotel was named after "Deliades",the "nymphs of Delos".The sea nymph motif is prominent in the reception area's beautiful carvings.The quiet atmosphere of Deliades hotel in Ornos, is enhanced by our impeccable service that is friendly, personal, and immediate, thus offering an unobtrusively luxurious experience to our guests. 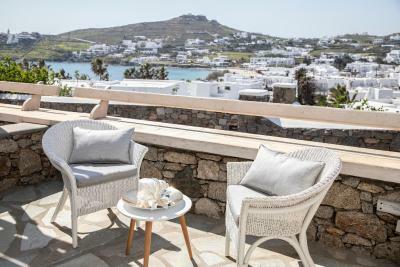 Lovely Ornos Beach is just a three-minute walk away.Far from the non-stop hubbub of Mykonos town, our hotel in Ornos is conveniently located and offers easy access to everything that Mykonos has to offer. House Rules Deliades Hotel takes special requests – add in the next step! Deliades Hotel accepts these cards and reserves the right to temporarily hold an amount prior to arrival. Please note that the hotel offers free transfer from the airport. Guests are kindly requested to inform the property in advance if they wish to make use of this service. Contact details can be found on the booking confirmation. 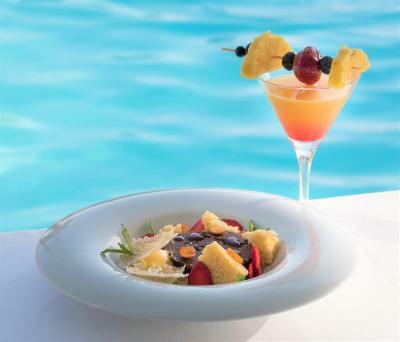 The halfboard package includes a 3-course dinner from an a la carte menu featuring traditional Greek and international dishes (all drinks and beverages are excluded from halfboard). Reservations with more than 5 rooms have different cancellation policies. Please contact Booking.com or the property for more information. Too many stairs to reach the room. The jacuzzi was not heated and so we couldn't use it. 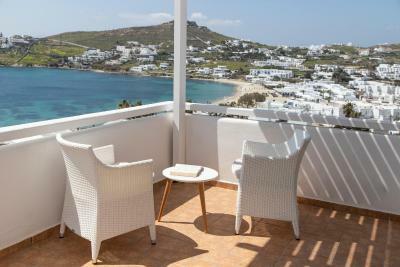 The location overlooking Ornos Beach is just perfect. Our first time to Mykonos. We were made to feel so welcome from the moment we arrived when Thanos met us at the port (transfer included in our stay) We stayed 4 nights as part of a months island hopping. The Hotel is lovely- our room was large with outside space own table and chairs, clean and very comfy bed. There is also a large roof sun terrace and seating area, cold tub ( although we didn’t use) A mins walk to lovely sandy beach with crystal clear warm water. And close to restaurants, bus stop and mini market. Rooms have fridges so great to have wine to chill in the evening. The staff are all so friendly, great choice of breakfast on terrace by the pool,superb. 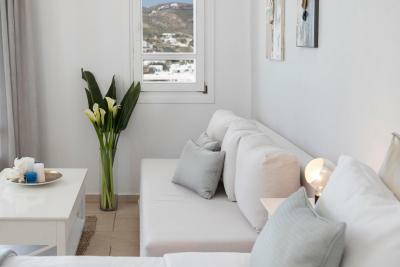 We would totally recommend this hotel and would def go back to the hotel on another stay in Mykonos. the view form the room, the location and the space is perfect. The rooms are very basic and a bit outdated. We stayed in the double room with sea view which is on the ground floor and the balcony is right next to the road. Not sure if the rooms are worth the price paid. The hotel is close to the beach, near good restaurants. The staff is very friendly and helpful. Highly overpriced. I paid 300eur a day for a room that didn’t worth more than 50 max 100! Furnitures are very old, poor breakfast, common facilities also poor. Overall disappointment. I asked for another room but still waiting for an answer. Our room was on the 5th level meaning we had many stairs to climb to get to our room. We had a lovely balcony which we didn't get much use of because it was so windy. Something at this level to obstruct the wind on the balcony would have been good. Pool is small and not good for children. But then the beach is a stone throw away. Great rooms, spacious, clean and lovely balconies! Awesome location with 3 mins stroll to the Ornos beach. Loved the hospitality and we will definitely be back. The location was great; on a hillside just a short walk from the beach. The hotel provided free transportation from the ferry. The gentleman who picked us up was waiting when we arrived and was friendly and helpful. The desk staff were nice. Good breakfast with many choices. We had an evening flight and checked out of our room in the morning, but the hotel was gracious in allowing us access to another room to shower before our transfer to the airport for our flight. Abdolutely amazing hotel. Beautiful, modern, spacious and comfortable. We will be back and will recommemd to our family and friends. 2 minute walk to Ornos beach, restaurants and bus stop (in to town). Staff were very welcoming and friendly. Our private transfer driver was fanastic!